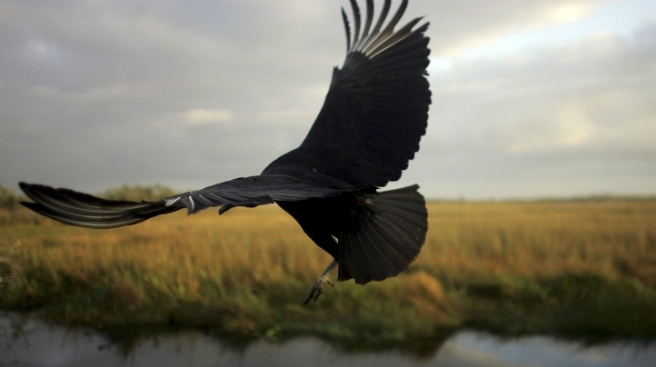 A black vulture flies in the Florida Everglades National Park in this 2006 file photo. Visitors to parts of Everglades National Park are getting tarps and bungee cords to make their vehicles less delectable to vultures. Migrating vultures have developed a habit of ripping off windshield wipers, sunroof seals, and other rubber and vinyl vehicle parts. Visitors to the park's Homestead and Flamingo entrances are loaned "anti-vulture kits" to protect their vehicles. Park wildlife biologist Skip Snow tells The Miami Herald that the vultures are migrating as normal. It's just not clear why the birds are picking at parked cars and trucks. Park employees have tried to scare away the vultures, but nothing has worked. Park Superintendent Dan Kimball says complaints about the vultures have declined since employees began distributing the tarps and bungee cords last year.